We at TAF Music Gifts are proud of the products that we sell and are confident that you will be happy with your purchase. If you have any problems or wish to return an item, please contact us first. Under the Distance Selling Regulations (2000), a British-based buyer may return any standard item within 7 days of purchase. Please contact us before returning any item so that we can issue you with a returns number to ensure your refund is swiftly processed. Please quote your invoice number in any communication. If you wish to return an item, you must send it back to us in its original condition within 7 working days for a full refund. We will refund the amount you paid for the item and, a percentage of your original postage*. In addition to the 7 day period, an item may be returned in its original condition up to 14 days from purchase, but in such cases we reserve the right to refund only the purchase price of the item less any PayPal charges incurred. We generally do not refund any postage costs on items returned after 7 days. It is the buyer's legal responsibility to take reasonable care of the item they wish to return. 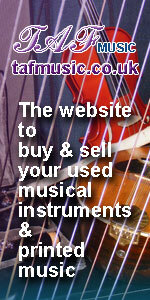 The buyer is responsible to pay the cost of returning the item to TAF Music Gifts. Any returned item must be sent by a service that provides proof of posting. Buyers outside Britain do not have an automatic right to return an item. As each item is hand made or indivdually assembled, we have a very low faulty product rate. We check each item before shipping, but still the rare problem creeps in or a product is occasionally damaged in transit, despite secure packaging. Should an item prove to be faulty, TAF Music Gifts will bear the cost of returning a defective item. Please contact us before returning any item so that we can issue you with a returns number to ensure your refund or replacement is swiftly processed. The buyer must use the most economical method to return the item and obtain proof of posting for postage to be refunded. Full details will be given to the buyer once a return request is approved. Any item returned as faulty will be inspected and tested prior to a refund being issued. If an item is not found to be faulty, we will issue a refund as per the standard product returns terms above. If an item is found to be faulty, TAF Music Gifts will, at the buyers request, either issue a replacement item (if stock is available) or refund the amount you paid for the item and a percentage of the original postage and packing charges paid*, plus your return postage. Personalized products such as clocks that have been customized with your text are generally not returnable unless they are faulty. If you have a problem with a personalized item, please get in touch with us and we will see what we can do to rectify the situation. If an item is damaged in transit - that is it arrives in a damaged condition, please inform us immediately. If the outer packaging is obviously damaged, please point this out to the delivery person where possible. You must inform us in writing either by email at the email address on your electronic receipt or through the contact form on this website within 48 hours of delivery if you wish to return or claim for an item that has arrived damaged. Please keep ALL original packaging for a damaged item, as we may need this to process a claim. As we charge postage on the total weight of the order, not on individual items, postage refunds on returned items will be for the portion of the original shipment net weight (e.g. total original order=100g, returned item=20g, refund will be 20% of the original postage). Buyers outside of Great Britain do not have an automatic right to return products bought from the TAF Music Gifts website. If you are an overseas buyer and have a problem with any item purchased through this website, please get in touch and we'll try to find a solution. The TAF Music Gifts return policy does not in anyway affect your Statutory Rights in Great Britain.